Men's singles -- Novak Djokovic (6), Serbia, def. Juan Martin del Potro (3), Argentina, 6-3, 7-6 (4), 6-3. 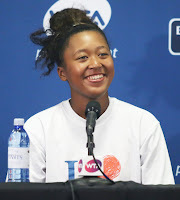 Women's singles -- Naomi Osaka (20), Japan, def. Serena Williams (17), United States, 6-2, 6-4. Men's doubles -- Mike Bryan and Jack Sock (3), United States, def. Lukasz Kubot, Poland, and Marcelo Melo (7), Brazil, 6-3, 6-1. Women's doubles -- Ashleigh Barty, Australia, and CoCo Vandeweghe (13), United States, def. Timea Babos, Hungary, and Kristina Mladenovic (2), France, 3-6, 7-6 (2), 7-6 (6). Mixed doubles -- Bethanie Mattek-Sands, United States, and Jamie Murray, Great Britain, def. Alicja Rosolska, Poland, and Nikola Mektic, Croatia, 2-6, 6-3 [11-9]. Boys singles -- Thiago Seyboth Wild (6), Brazil, def. Lorenzo Musetti, Italy, 6-1, 2-6, 6-2. Girls singles -- Wang Xiyu (3), China, def. Clara Burel (11), France, 7-6 (4), 6-2. Boys doubles -- Adrian Andreev, Bulgaria, and Anton Matusevich, Great Britain, def. Emilio Nava and Axel Nefve, United States, 6-4, 2-6 [10-8]. Girls doubles -- Cori Gauff and Caty McNally (1), United States, def. Hailey Baptiste and Dalayna Hewitt, United States, 6-3, 6-2.